Lunch with Aldo Zilli at San Carlo. What a treat. San Carlo which of course in German means a whale’s… nevermind. I must admit that before the invite to lunch at San Carlo I had never visited. Our paths had never crossed. I can draw you a Venn diagram. Let me know, I’ll knock one up. It’s not a problem. San Carlo opened their first restaurant in 1992 and now have locations across the country. We were at the Bristol restaurant on Corn Street to attend a showcase of new dishes cooked up by Aldo Zilli, the Italian-born celebrity chef. We started with some mild banter and a Sicilian orange, fennel & basil salad whilst Tony DeDominicis (the General Manager) proceeded to grate black truffle over the dishes to his heart's content. I get the feeling he wouldn’t have stopped until the table resembled some kind of ash-covered apocalyptic Pompei-esque vista. Luckily, Aldo stepped in. 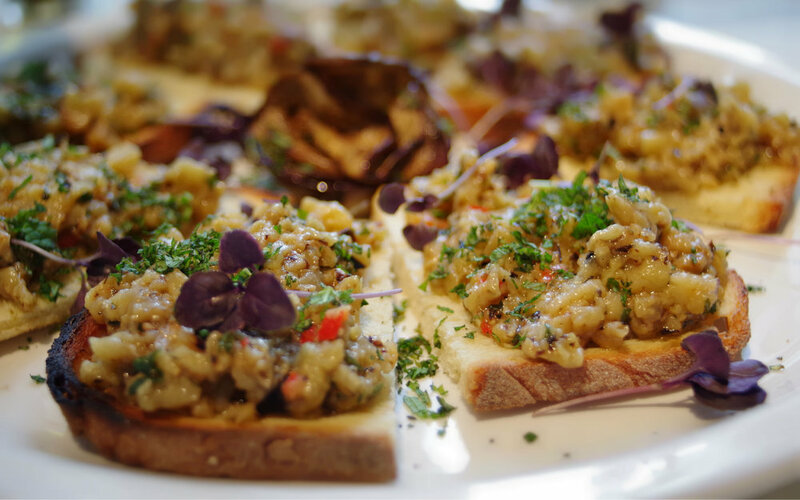 The Bruschetta of Altamura bread with purple aubergine and mint which was fresh and colourful (and even more delicious when covered in truffle oil). It would be great to bring this kind of the formal dining arrangement out of the restaurant and to the masses as part of an event such as Make Sunday Special. Showcasing the simple, classic flavours of Italian food could really open San Carlo up to a new audience and chance to delve into the more informal side of Bristol dining..
Tony was keen to show us how a proper fillet tartare should be made, which he endeavoured to do right at our table. The show was broadcast via Periscope by Aldo to his formidable Twitter audience. I waved awkwardly. The whole thing was perhaps more of an event than it was about the actual taste of a dish, and sometimes that’s part of the experience that I want. Especially from an Italian restaurant. A timid waiter sliding a pizza onto the table would not have fit the bill. No, this was wine-fuelled debauchery. Raw fillet beef with gherkins, capers, shallots, anchovies, and a healthy splash of Tabasco. Served with toast and a side serving of showmanship. San Carlo also pride themselves on their seafood, and we had a number of different dishes to prove this - including one of my favourites of the meal: Chargrilled Sicilian prawns, mint pesto and pine kernels. We also had Lemon sole with carciofi and wild garlic - again nice and fresh and well cooked - everyone loves a bit of wild garlic don’t they? A prominent position in central Bristol and a large, open & comfortable restaurant aren’t a guarantee of success anymore. Luckily San Carlo offer the quality of food to match the set up. The new menu demonstrates the emphasis on quality, fresh Italian food and is definitely worth another visit.